(JTA) – Trying to understand the upcoming Israeli elections can get confusing. The country’s longtime prime minister, Benjamin Netanyahu, is mired in a series of corruption scandals and facing a serious challenge from a new rival. Other politicians are maneuvering behind the scenes to form new coalitions that would allow them to be included in Israel’s parliament majority and thus have more influence over Israeli policies. It’s a fascinating race that changes by the day. The following guide, broken into topical sections, breaks down how Israel’s government is constructed and who the major players are in the campaign to govern the Jewish state. Israel’s election is a free for all: Instead of two major parties, there’s a whopping total of 47 parties competing at the ballot box. Israelis vote for parties, not individual candidates. The more votes a party gets, the more seats it has in Israel’s 120-seat parliament, the Knesset. A government is formed by a party – more likely a coalition of like-minded parties – that captures more than 60 seats. More than a dozen parties could make the next Knesset. Here’s a short description of each of them. Likud, Israel’s right-wing flagship, and Netanyahu’s party, opposes a Palestinian state, supports settlements and encourages privatization in the economy – but its main selling point is the longtime prime minister, who is seeking his fifth term. Blue and White is a new centrist coalition led by a former military chief of staff, Benny Gantz. It was created to oppose Netanyahu and his alleged corruption. The New Right is kind of like Likud on steroids: Led by the prominent figures Naftali Bennett and Ayelet Shaked, the party staunchly opposes Palestinian statehood and supports settlement growth, and features a very hawkish defense policy – what its platform calls an “iron fist” against Israel’s enemies. Jewish Home-Jewish Power is the controversial union between a religious Zionist party and a far-right party, also known as Otzma Yehudit, that supports implementing religious law and waging “total war” on Israel’s enemies. Israel Beiteinu champions the interests of Russian-speaking immigrants, along with a hard-line defense policy that calls for the execution of terrorists. Kulanu is a center-right party focused on lowering Israel’s high cost of living. Zehut is an unusual mix: libertarian – and in favor of marijuana legalization – but strongly against Palestinian statehood and Arab-Israeli equality. Labor is the sad trombone of Israeli politics. Once the left-wing flagship and largest party in the country, it’s now an also-ran to Blue and White. Meretz is about as far left as you can go while remaining Zionist, supporting a Palestinian state alongside Israel along with minority rights and religious pluralism within Israel. United Torah Judaism is the Ashkenazi haredi party – the guys (they’re all guys) who support Orthodox control of Israel’s religious life, oppose mandatory army service for their followers and speak Yiddish. Shas is the Sephardi haredi party – the guys (again, all guys) who stand for religious traditionalism as well as the rights of Israel’s Mizrahi (Middle Eastern and North African) Jewish population. Hadash-Taal supports Palestinian statehood and advocates for Israel’s Arab minority. Balad-Raam supports Israel being a secular state for all its citizens and no longer a Jewish state. Can Netanyahu withstand corruption charges? Netanyahu is the first sitting prime minister to be indicted on criminal charges – but that doesn’t mean he won’t be re-elected in April. Netanyahu allegedly attempted attempted to improve his press coverage through illegal deal-making on multiple occasions and is accused of receiving $200,000 in illegal bribes of Cuban cigars and champagne. He was indicted on Feb. 28, but his hearing will not be held before the elections. Netanyahu’s situation is not quite unprecedented: In 2008, his predecessor, Ehud Olmert, resigned before he was formally indicted on bribery charges. Olmert eventually was convicted and served 16 months of a 27-month sentence. But unlike Olmert, Netanyahu will not step down and remains defiant. Netanyahu served a term in the 1990s and has served continuously as prime minister for the past decade. Some polls have shown Blue and White inching up and even surpassing him, although the coalition math still favors the right. Even if Netanyahu is re-elected and formally indicted, there is likely no legal requirement that he step down from office – though not leaving would certainly be an eyebrow-raising choice. At the last minute, a new party has entered the Israeli political scene and stands a decent chance of toppling the ruling Likud party. 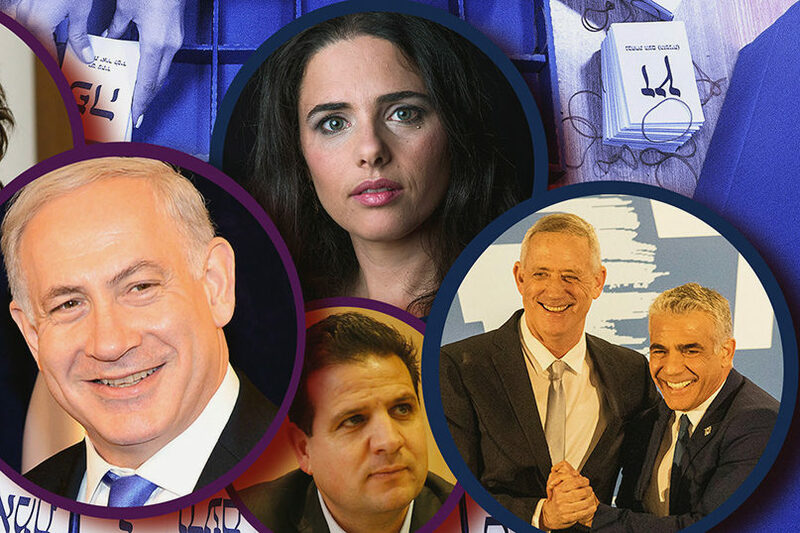 On Feb. 21, the last day to submit a party list for the elections, Gantz decided to merge his fledgling Israel Resilience Party with media personality and politician Yair Lapid’s established centrist Yesh Atid. They named the alliance the Blue and White for the colors of Israel’s flag. Yesh Atid, a surprisingly successful party established in 2012, is almost radically centrist and focuses primarily on social and civic issues. It’s still hard to discern where exactly Gantz stands on most issues, but from what we’ve seen, he is a centrist as well. Blue and White’s platform emphasizes global collaboration on security issues and true Israeli democracy that recognizes Israeli Arabs as equal citizens and requires religious Jews to serve in the IDF. Though this is Gantz’s first foray onto the political stage, he is well respected as a general, having served as the chief of staff for the IDF from 2011 to 2015. In Israel, former chiefs of staff cannot serve as prime minister for at least three years after completing their service, so this is Gantz’s first opportunity to do so. If elected, Gantz and Lapid would alternate who gets to be prime minister, with Gantz serving for the first two years. In February, Netanyahu helped broker a pact between an extreme right-wing party, Jewish Power, or Otzma Yehudit, and the more moderate right-wing Jewish Home. By combining forces, the parties would have a better shot at winning Knesset seats than making it on their own. This is a big deal for one main reason: Netanyahu is effectively legitimizing the ideology of the late Meir Kahane, an American extremist rabbi known for his legacy of violence and spreading hate in both Israel and America. Although he was assassinated in 1990 in New York, Kahane’s racist legacy lives on in Israel through groups such as Jewish Power and their followers (known as Kahanists). Jewish Power is a descendant of Kahane’s Kach party, which was outlawed in 1988, when Kahane himself was up for re-election (he served one term in the Knesset). While some of Kahane’s ideas have moved to the mainstream Israeli right, he is still undeniably considered an extremist figure. Netanyahu has taken much heat for the move both at home and abroad. Labor, the party of many Israeli political legends – think David Ben-Gurion, Golda Meir and Yitzhak Rabin – is expected to finish fourth(ish) in the election. It hasn’t won an election in two decades, and now it has been supplanted as the main opposition party by Blue and White. Its best hope is to be a junior coalition partner in the next government. So what happened? Labor used to be almost synonymous with Israel: It stood for social democracy, kibbutzim, a strong defense posture and negotiations with the Palestinians. In 1999, it was riding high; Party leader Ehud Barak had defeated Netanyahu in the election, and was pushing toward a peace treaty with the Palestinians. But negotiations failed and the second intifada began – an unprecedented wave of terror attacks in Israel that led to a clampdown on Palestinians in the West Bank. Since then, Labor has lost its mojo. Likud and its offshoots have led the Israeli government for the past 18 years. Israelis have lost hope in peace coming anytime soon (even though a large portion still supports Palestinian statehood). And the whole country, including Labor itself, has moved away from Israel’s former socialist identity. More of the country has become privatized, and though inequality has risen and the housing market is dire, the economy in general is humming along. Labor has tried to rebrand as a centrist party, and came close to winning the last election in 2015. But since then it elected a former business executive named Avi Gabbay as its leader, and he hasn’t captured Israelis’ imagination. Voters who oppose Netanyahu have turned to Blue and White, which leans to the right. In December, Israeli government ministers Naftali Bennett and Ayelet Shaked broke away from the Jewish Home party that Bennett headed to form a new right-wing party. They said they were not doing it to hurt Jewish Home, but rather to benefit the larger right-wing bloc. Bennett is religious and serves as education minister; Shaked is secular and serves as justice minister. They describe the New Right party as a home for Israelis who are right-wing, but do not necessarily buy into the religious political agenda of Jewish Home. The party’s platform calls for the cooperation of religious and secular Jews, full civil rights for minorities and a belief in personal freedom. But it also has a familiar right-wing tone, with its opposition to a Palestinian state, its view that Israel is the nation-state of only the Jewish people and its promotion of the Jewish character of the state. Bennett has already said that the party will join a government formed by Netanyahu and will continue to support him until he is convicted of any of the charges for which he is set to be indicted. So a vote for the New Right is a vote for Netanyahu. Israel’s Arab minority has the right to vote, but Arab-Israeli parties – there have been several over the years – never sit in Israeli governing coalitions and usually are at odds with both the Israeli Jewish left and right. This year, that split Arab-Israeli representation in the Knesset could shrink. For the elections in 2015, the four Arab-Israeli parties united in a coalition called the Joint List and became Israel’s third largest party, as well as a symbol of opposition to the right-wing government. Despite its size, the Joint List could not block legislation that it hated, including the controversial Nation-State Law. Now it has split. The four parties are running as two competing factions: The religious Raam with the secular-nationalist Balad, and the Arab-Jewish leftist Hadash with the comparatively moderate Taal. The schism, a result of political infighting, could lead the parties to lose a couple of seats collectively. Parties across Israel’s spectrum have long refused to join coalitions with Arab-Israeli political parties. Politicians usually frame this refusal around the Arab-Israeli parties’ opposition to Zionism and Israel’s Jewish character – they are fundamental to the platforms of the major Jewish parties. But it’s almost certain that that plea will go unheard. Netanyahu’s main opponents, Blue and White, lean to the right. And it has already vowed not to partner with Arab-Israeli parties. JERUSALEM (JTA) – Israel’s Supreme Court voted to disqualify Michael Ben Ari, head of the far-right Jewish Strength or Otzma Yehudit Party from running in national elections over his racism and racist incitement. The court decided on Monday, March 18 by a vote of 8 to 1 in favor of an appeal by the Reform Movement in Israel, represented by the Israel Religious Action Center, to overturn a decision made by the Israel Central Elections Commission on March 12 to allow Ben Ari to continue his campaign. Ben Ari has said the remarks cited by the petition have been taken out of context. Ben Ari is in the fifth slot on the joint slate of the Union of Right-Wing parties, which gave him a realistic chance to join the Knesset. He served in the parliament from 2009 to 2012 as part of the National Union Party. Ben Ari’s party joined with The Jewish Home and National Union parties to form the Union of Right-Wing Parties in a deal brokered in part by Prime Minister Benjamin Netanyahu. “Today, the Supreme Court sent an important message that racist incitement has no place in Israel’s democracy,” Anat Hoffman, executive director of IRAC, said in a statement. The Supreme Court also decided to reinstate the Arab party slate of the Balad-Ra’am and Ofer Kassif a far-left Jewish candidate running on the slate of the Arab Hadash-Ta’al parties.